Thank You, JLC, For All You Do!!! If you’ve cruised down Devine Street in the last month or so you have likely noticed the billboard above the Junior League of Columbia’s Headquarters between Za’s and Half Moon Outfitters. All I can say is THANK YOU to the Junior League for this amazing display of gratitude. Moreover, I would like to thank and hope that all of the readers of this blog recognize and appreciate all of the sponsors and partners of the League that are on the banner in the pic above. 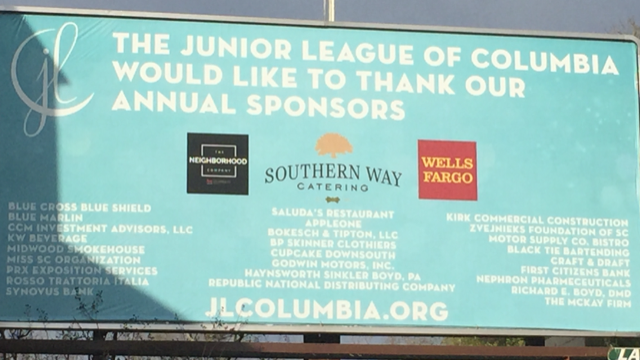 As many of you know, The Neighborhood Company is proud to be a longtime sponsor, as The Junior League of Columbia continues to be a leadership organization in the Midlands. If you or anyone you know would like to know more about the Junior League of Columbia and how being a sponsor is different and amazing, please call 803-447-8683 or email Franklin@TheNeighborhoodRE.com. I would love to speak with you! Thank you for the shout out, JLC!!!!! !